The Dibrugarh Municipal Board (DMB) has launched a crackdown against unauthorised advertisement hoardings and billboards installed in Dibrugarh town. DMB started the crackdown on Tuesday and removed some illegal hoardings installed in the town without paying any revenue to DMB. The crackdown on illegal hoardings will continue in the days to come, said a DMB official. The unauthorised hoardings were come up in Dibrugarh town during Congress rule but DMB didn’t take any action to pull down such illegal hoardings. In 2015, with full majority DMB was formed by BJP but it seems that they have not taken any step to pull down such illegal hoardings. According to source, 75 percent hoardings are illegal in Dibrugarh town and the DMB is not getting any revenue from it. Even the administration has not shown any interest to pull down the illegal hoardings. “On the first day of the drive, we have removed five hoardings from Amolapatty area which were illegally placed. DMB is not getting any revenue from these illegal hoardings and as per rule we have removed the hoardings,” Jain said. She added their crackdown against illegal hoardings would continue. Last year Rachna Jain took charge of hoardings. Many illegal hoardings were placed at Thana Charali, Poolbagan, Chokidinghee, Gabrupathar are of Dibrugarh town. Sources said ex-vice chairman of DMB Jugananda Sensua on December 8, 2015, sent a letter to Bipul Phukan, then in-charge of advertisement hoardings asking to show details of the hoardings and revenue. But he didn’t get any reply from Bipul Phukan. On December 21, 2015, he had again sent a reminder to Phukan to show him the details which he failed to do. 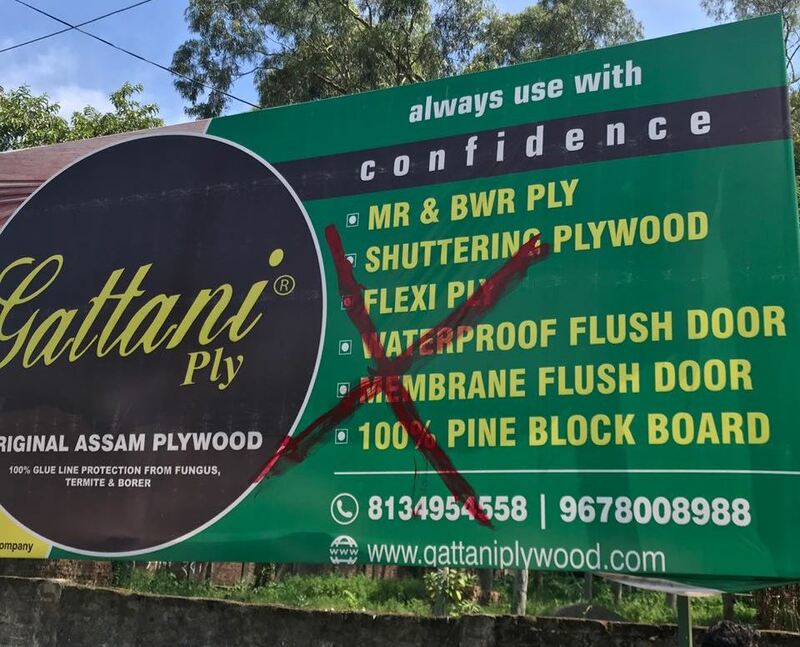 “Bipul Phukan is managing everything and not maintained the accounts of the said department as prescribed under Assam Municipal Act, 1956,” alleged a source. “Due to unauthorised hoardings, DMB is suffering huge loss every year. It’s a huge racket which has been running since the regime of Congress government. It seems that BJP leaders are also doing nothing to stop such scams,” a senior official said.